Successfully Added Mini Bluetooth Keyboard with Powerbank - 54 Keys, 5000mAh (Black) to your Shopping Cart. Mini Bluetooth QWERTY Keyboard with 54 Keys and built-in 5000mAh powerbank. 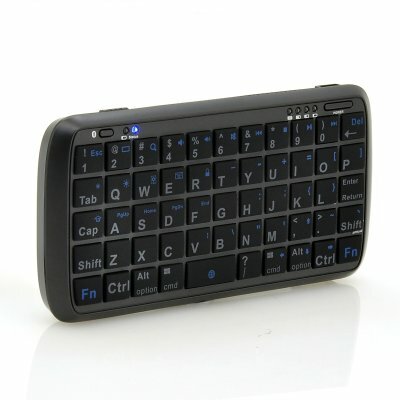 This 2 in 1 multifunctional keyboard can charge your 5V electronic gadgets on the go! 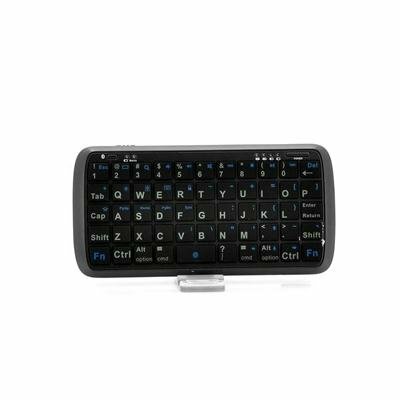 This Bluetooth QWERTY keyboard features 54 soft rubber keys and can be paired with most major mobile phone operating systems such as Android OS, iOS and Windows Mobile 6.0. Using the latest Bluetooth 3.0 connection standard, the keyboard has a connection range of up to 10 meters and included a 5000mAh back up battery. This handy extra will allow you to charge all your mobile devices on the go! Design to be taken anywhere, this keyboard will give you a better typing experience wherever you are! Very good quality.Amazing battery.it is compatible with all my devices. As described. Good workmanship. Practical design. Very good keyboard, light and small enough to put it in a pocket. The power-bank functionality comes handy when you need to feed a tablet or a phone on the road - and it works as expected. Very handy, useful and it's also power bank. I love it. No bad points, I wish only the android market to had a gadget to be able to change between english and your language when you use external keyboards.